Well, I have chosen this theme for a winter wedding to write about first, as it's my very favorite. It evokes such warm, happy and romantic emotions, which is all the reasons why I love the holiday season so much. Think crackling fireplaces, warm glowing candles, apple cider and hot chocolate, a cabin in the woods and old fashioned snowshoes. This collection includes a fresh spin on the rustic look, maybe a bit warmer climate? I love the shots of milk with cookies, the tree trunk candles, the very cute spin on a jacket for the bride and the Christmassy peppermint candies. This look may suit a couple that really could not choose whether to go modern or rustic, so they chose a theme that is middle of the road. I call it a Fresh Rustic look. The above two photos really represent a true rustic feel. The warmth of candles and the integration of bringing the outdoors in, using natural elements such as tree branches and cranberries to set the atmosphere. S'mores! Oh my goodness, maybe the BEST thing about doing a rustic, cabin-in-the-woods type wedding is the soul food. 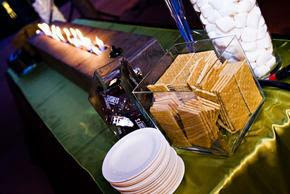 A s'more station is perfect for this setting, as is cookies and milk, hot chocolate, peppermint lattes and apple cider. For the menu I would choose comfort foods above schmoozy foods. 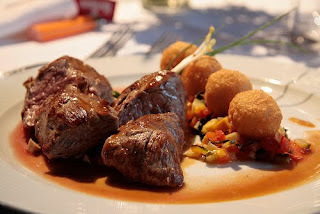 Roast beef with root vegetables, lamb (although I am not a fan, many are...), venison, or roast tom turkey for the main course. Chicken noodle, French onion, or beef and barley soup, fresh bread or rolls, or gourmet macaroni and cheese to follow, oh I could go on forever! And for dessert, eggnog and nutmeg crème brûlée or, if you're anything like my dad, enjoy a warm slice of apple pie with vanilla bean ice cream to finish off this hunting-lodge inspired meal. And for the midnight buffet? Home cooked chili with grilled cheese sandwiches, sour-cream and garlic toast (I swear, I am not even hungry right now!). In my opinion, this type of atmosphere may appeal more to a smaller more intimate wedding to really adhere to the cozy feel you may be looking for. Being a mountain region, we are lucky to have several venues that would work for a rustic winter wedding. 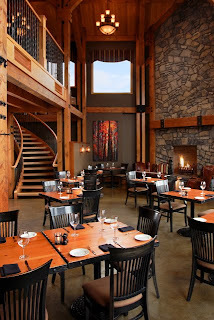 Some to consider would be Kicking Horse Mountain Resort, The Cochrane RancheHouse Fernie Alpine Resort, Bear & Bison Inn,and my personal favorite for this theme Iron Goat Pub & Grill in Canmore, Alberta (see below picture to be sold on this venue!). As I have mentioned before, usually a dress is a great indicator of the theme for a wedding, and this is no exception. I am not here to say you can't have whatever dress you want, but I am a firm believer that different dresses set different tones and themes. I think for a rustic wedding lace and vintage is a great look. I have always been a fan of Jim Hjelm dresses, I think I have a few dozen save in my "Favorites" on my laptop as I think they are such beautiful designs. All the dresses below are Jim Hjelm and I think would be perfectly lodge-chic. Well, there you have it, the cozy, rustic winter wedding. 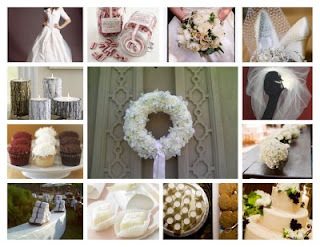 No matter what time of year you decide on marrying, there will be special seasonal elements. 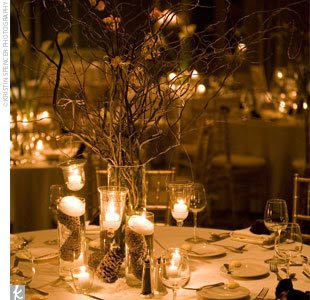 If you are seeking a warmer (indoor), more intimate occasion, this theme may be just perfect for you.